Award to our METALOGUE Presentation Trainer! 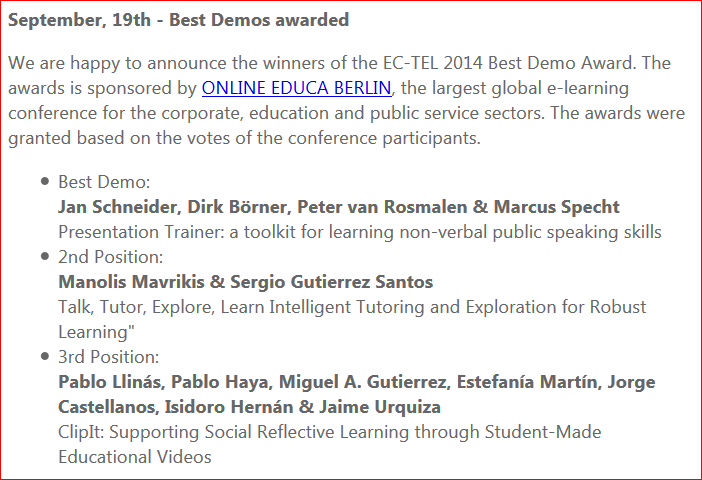 Our EU project METALOGUE has won the EC-TEL 2014 Technology-Enhanced Learning Best Demo Award! Our METALOGUE Partners at the Dutch Open University (OUNL) demonstrated and won the audience over with their Presentation Trainer, a public speaking instructor which tracks and analyses the user’s body posture and movements, speaking cadence and voice volume, and provides instructional feedback on their non-verbal communication skills (sensor-based learning). Congratulations to our OUNL partners!